Re: Any other watch geeks here? I have close to 30 watches at the moment. They range from weird no-name $5 automatics that I got on ebay to my U-Boat Flightdeck. My daily wear is an Orange Seiko Monster, the thing is a tank and looks great. My daily wear is an Orange Seiko Monster, the thing is a tank and looks great. 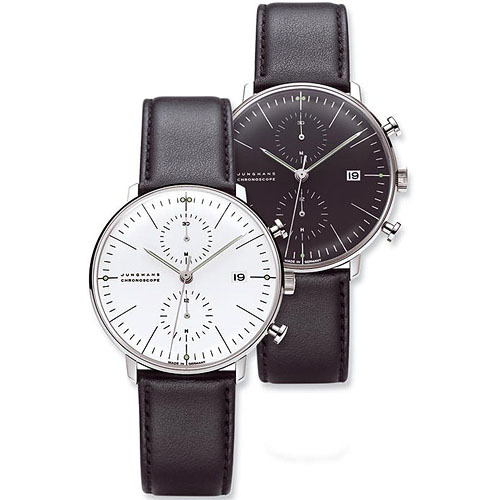 I'm thinking about getting a black one with the black rubber band, they're great watches. Have the same watch... love it. However my boss is a watch freak, and his "daily" wear is a Ulysse Nardin michaelangelo. If you ain't first... ...you're last! I'm a huge fan of Bell & Ross watches. 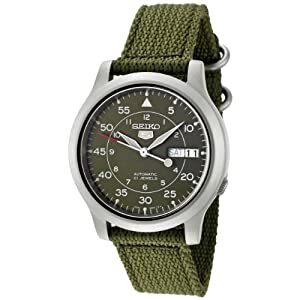 I don't have the budget for any of the watches I really want. I have a cheap fossil I wear around sometimes (haven't been since the batt died). A while ago a buddy of mine owed me some cash so I worked a deal out w/ him for his watch that I LOVED. 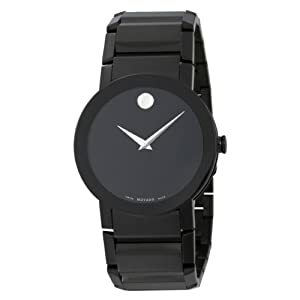 A lot of people crap on movado since they're so common, theoretically overpriced, etc. But I love how simple this one is. I don't wear it terribly often anymore though. I just got one of these. At $65, I couldn't refuse it. I have that same on that my fathers. just like below but with out the daimonds.... I also have gold president?? with daimonds .... I wear them about 1x a month. and just sent one in for servicing..... 650$.. ouch. My latest was my fathers second of three Rolex's. 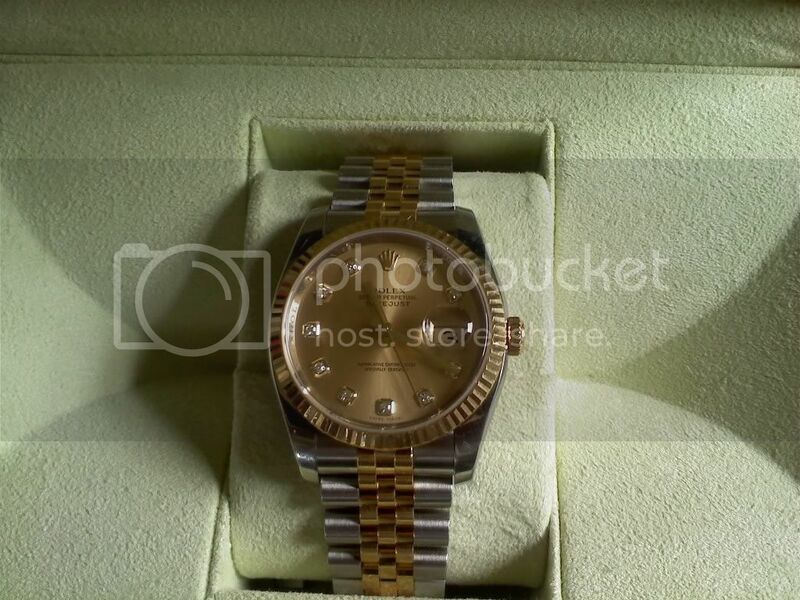 An Oyster Perpetual Datejust in stainless with 10 diamonds and a gold/ss bracelet. It'll stay in the safe deposit box for 99% of the time. You have a watch winder for yours right? I'll be looking at them when I get it appraised for insurance purposes. There are several watch names that are very popular and are total crap. It's all about the movement used. One Tag watch uses a $10 movement in a $1200 watch. Same thing with some Concord and Movados. That B&R is a nice aviation themed piece. I have a similar styled Steinhart that gets many remarks. Heh, just saw this, I got the same ring. So I had a discussion with one of the sales people @ Perriwinkles in Burlington Friday afternoon while my Oyster Perpetual was being appraised. He told me that it was VERY important for Rolex automatics to be placed on watch winders when not being worn. He said that there are (5) different lubricants used when the watch is serviced and if the watch doesn't stay "active" that the lubricants all settle to the low spot and when you do wear the watch again it runs dry for a little while. Since I will wear this watch very rarely I ordered a winder. $125 for the appraisal and another $80 for the winder would buy me a decent watch! I'm guessing this applies to all self winding watches. It's definitely best for mechanical watches to run regularly, whether they're automatic or hand-wind. Lubricants can congeal during periods of disuse. Thought you might find this interesting... I was in Singapore last month and picked up a Tudor Fastrider. Tudor is a sub-brand of Rolex, less expensive and sportier. There's even a Ducati version... Unfortunately, I don't think they sell them in North America. VERY nice watch!! I know the brand. The only place I've seen Tudor is in NYC. Most people would look at that watch and not think it's price is $2k or more. That's exactly the type of watches I own/collect. It's the off name brands that appeal to me. They still can cost much $$$$ but wearing them in public probably won't get me robbed as most idiots are looking to steal Rolex/Brietling etc. Family gave me this as a gift for getting my wings. Just got it tonight. I'm afraid to wear it. Geeks: Anyone have any 2U enclosures they don't want?